Game of Quilts: Winter is Coming! Make Quilts! So I began reading and binge watching the series. Two scenes spoke to me as having images and symbols that would translate to the quilts using the required colorways. 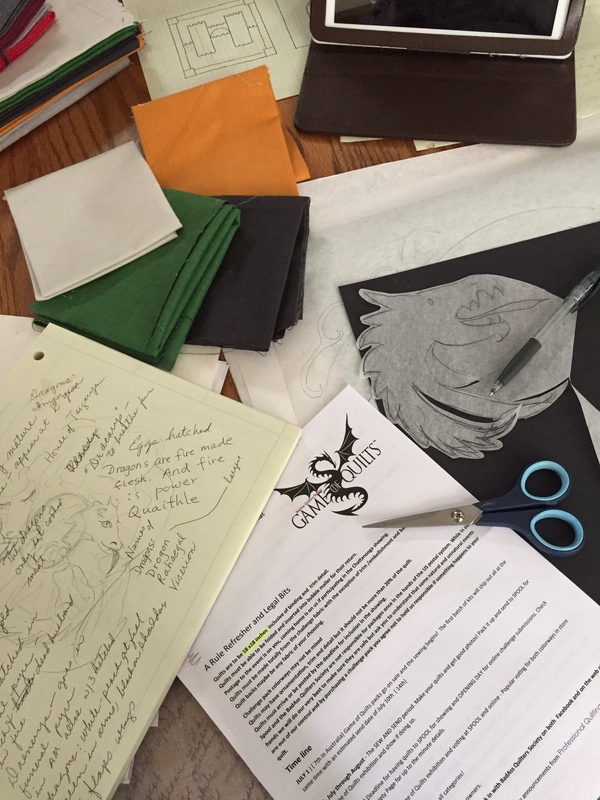 The first was the birth of the dragons using the “Mother of Dragons” set of fabrics. 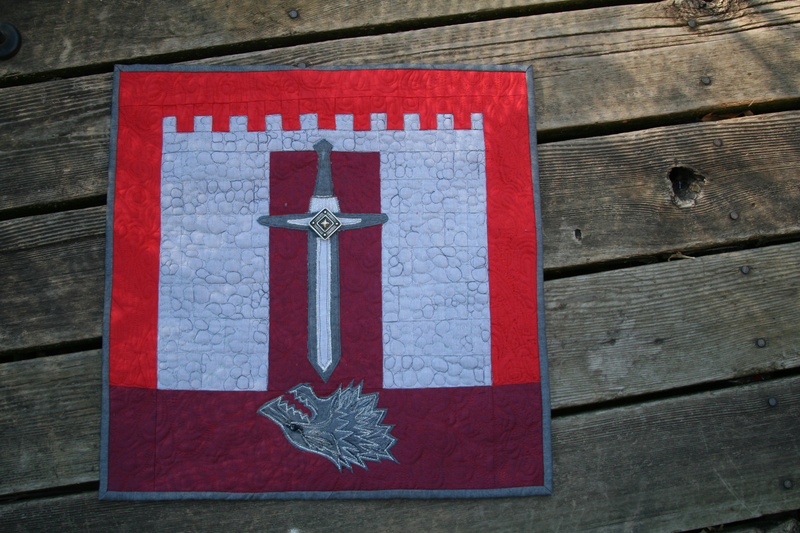 The second was the “Red Wedding” using the fabrics from “Blood-Stone-Steel and Fire.” For the contest, the quilts could be entered online for voting or mailed to SPOOL to be exhibited there and voted on during AQS Quilt Week. 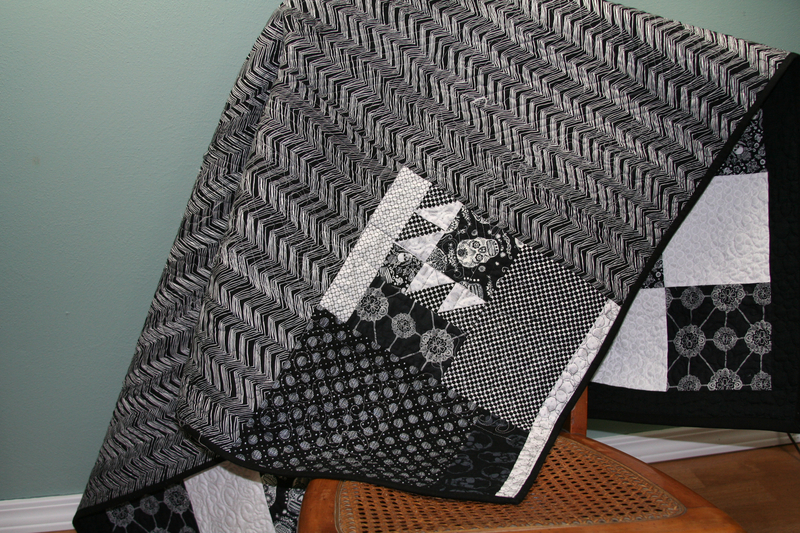 I mailed both quilts to SPOOL, but decided to submit only one for online voting. Voting for online entries begins on September 16 and ends on September 19. There are already fabulous entries showing loads of imagination, creativity and workmanship. Kudos to all who have entered! To view the entries and vote, click on this: BadAss Quilters Society–Game of Quilts. 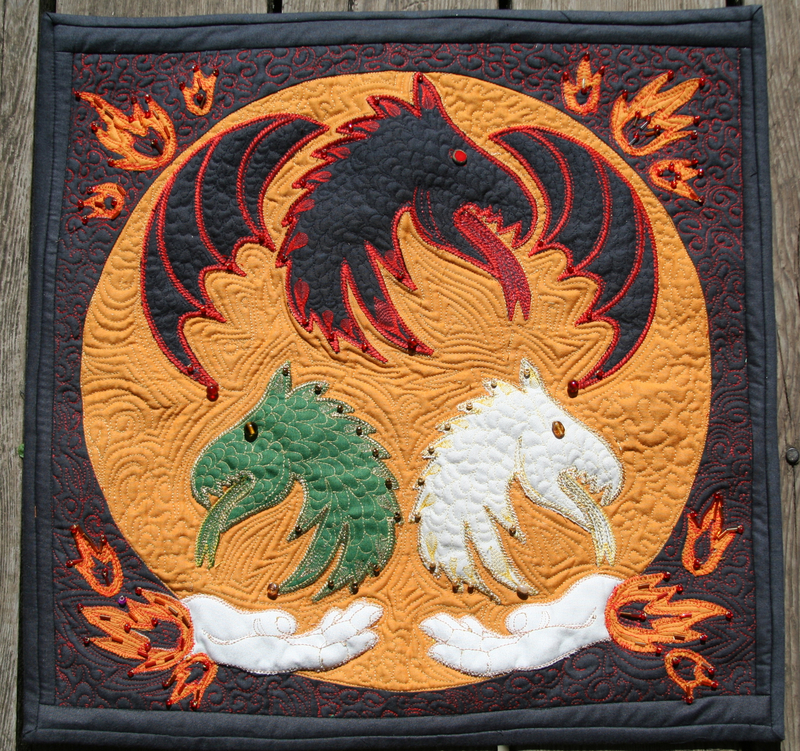 “Birth of Dragons” is the mini quilt I submitted for online voting and was mailed to SPOOL. The circle represents Drogo’s funeral pyre. The hands represent Daenerys. It is from this fire that the three dragons were hatched and an unscathed Daenerys emerged as the Mother of Dragons. “Bread and Salt” was submitted to SPOOL, but not submitted for online voting. Walder Frey shared bread and salt with the Starks thus giving them the promise of protection of guest right. This bond was broken by Frey when the massacre of the Starks ensued. The castle walls represents the Freys, the dire wolf represents the Starks, and the dagger represents the broken bond and the massacre. The maroon inside the castle walls represents the bloodshed. The firey red outside the castle represents the continued violence outside of the castle walls. Both quilts were created using piecing, applique, free motion quilting, thread painting, and more than a couple glasses of wine. Some beads and baubles were added to both quilts. The castle walls were pieced and the circle of fire was inset. 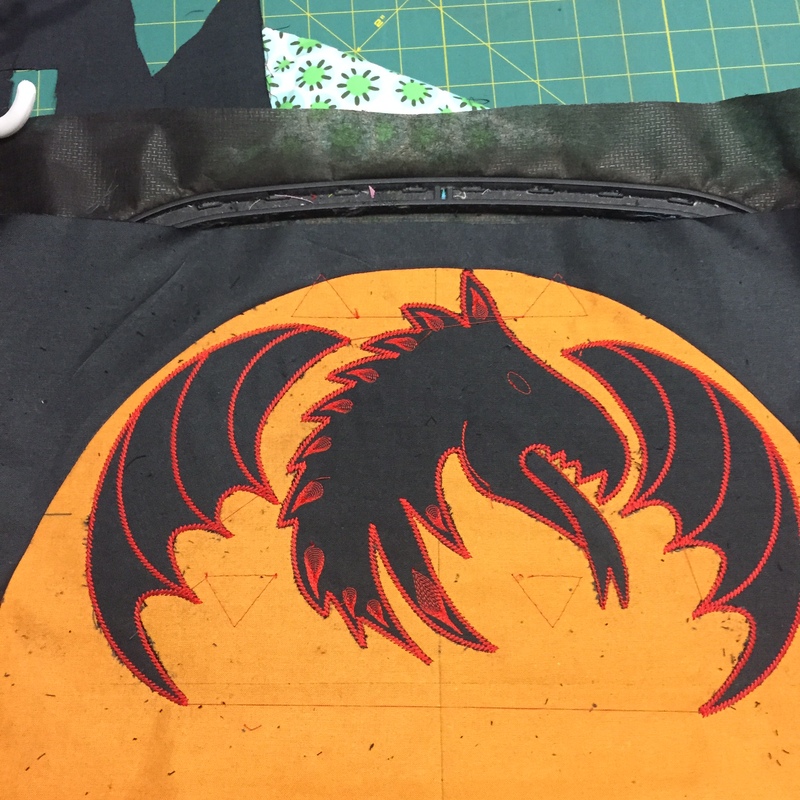 Some appliques (dagger and dire wolf) were first hand drawn then transferred to fabric fused to an applique stabilizer. They were appliqued onto the quilt and details were added. 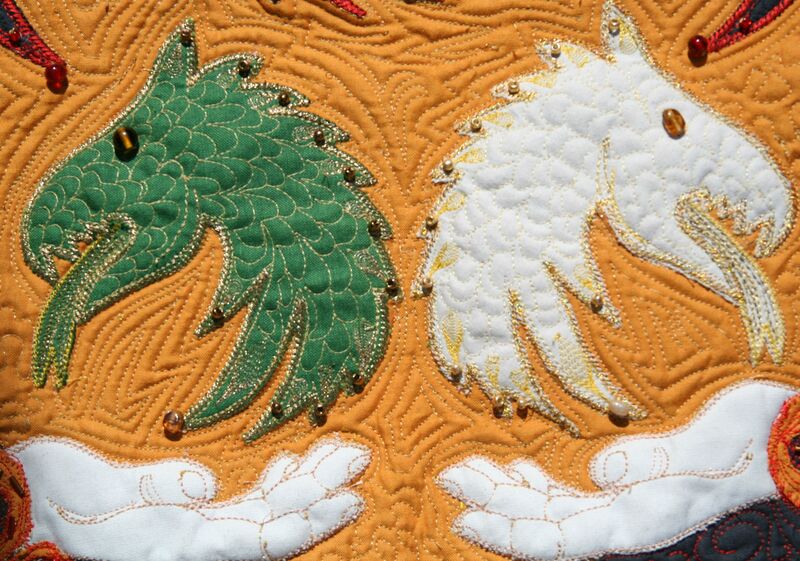 Other appliques were created by scanning drawings (dragon heads and wings) or a photograph (hands) to my software (Bernina V7). 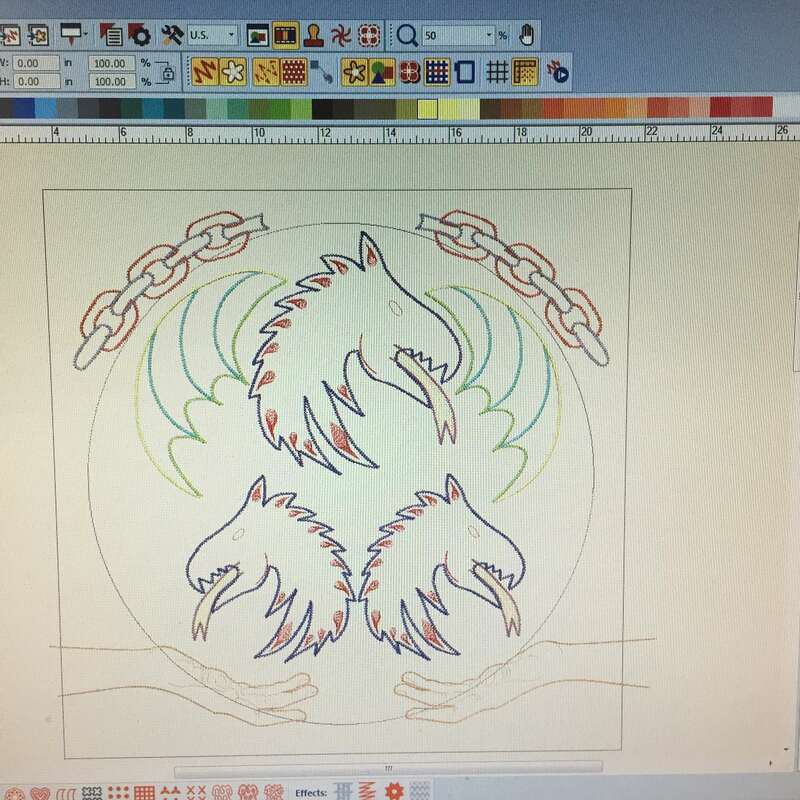 The wings and dragon heads were manually digitized for applique and details were added. The wings and dragon heads were added to the prepared background via machine embroidery onto a thin batting which was later trimmed away. When the quilt top was layered onto the batting, these elements were stitched around sort of trapunto style. This was done to give texture and to have these elements stand out from the background. Line and details were digitized using the image of a hand as a guide. This was stitched onto the fabric which was backed with a thin batting. The hand was trimmed then appliqued (not with machine embroidery) to the bottom of the circle. Because of the intense quilting and thread play, a false back was added to each quilt then lightly quilted. This was part of the process for “The Birth of the Dragons” before summer took on a life of its own and I forgot about photographs. The first photo is part of the brainstorming and initial planning and drawing. Photo two shows playing with paper cutouts of design (I had resorted to wine at this point). The third photo shows software layout on the computer screen. Notice the broken chain at top. The original title was to be “Mother of Dragons–Breaker of Chains.” However, the best laid plans of mice and men and all of that seemed to rule. Finally, the last photo shows the finished top dragon. 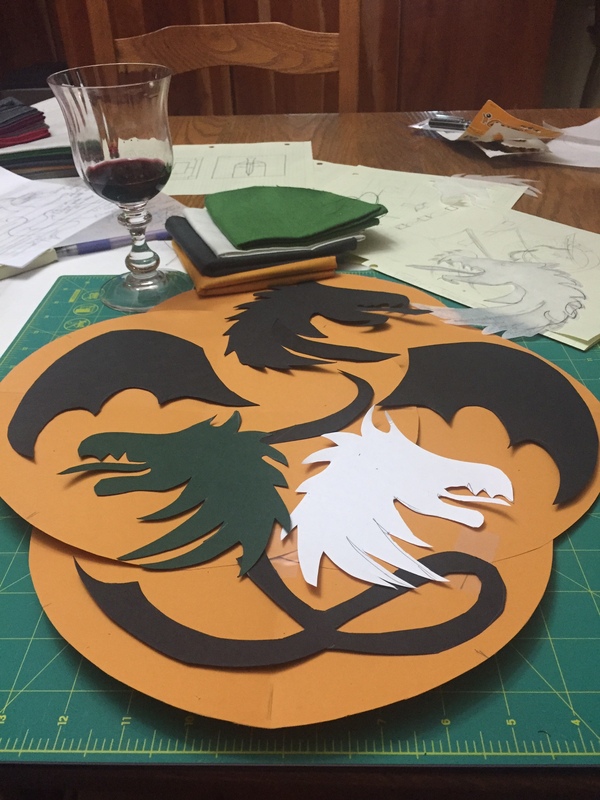 A second hooping was required to stitch the smaller dragons. I enjoyed participating in this challenge. And challenge it was at times. Working with just four colors of fabric was a challenge, but a good one. I had not worked much with my software for a while so I had to do some head scratching to get started. Then there was the “shrinking” of fabric on “The Birth of the Dragons” quilt. The background with an inset circle was made first and while I allowed extra fabric all the way around to compensate for the draw in of quilting, I did not add enough as this quilt has a couple layers of batting in places and is heavily quilted. This resulted in some difficulty in the finishing of the quilt. While I am not entirely happy with that, I am happy with the interior of the quilt and decided to submit it for online viewing, warts and all. Thank you for viewing my mini quilts! One April morning I was having a second cup of coffee and scrolling through Facebook when something caught my eye. 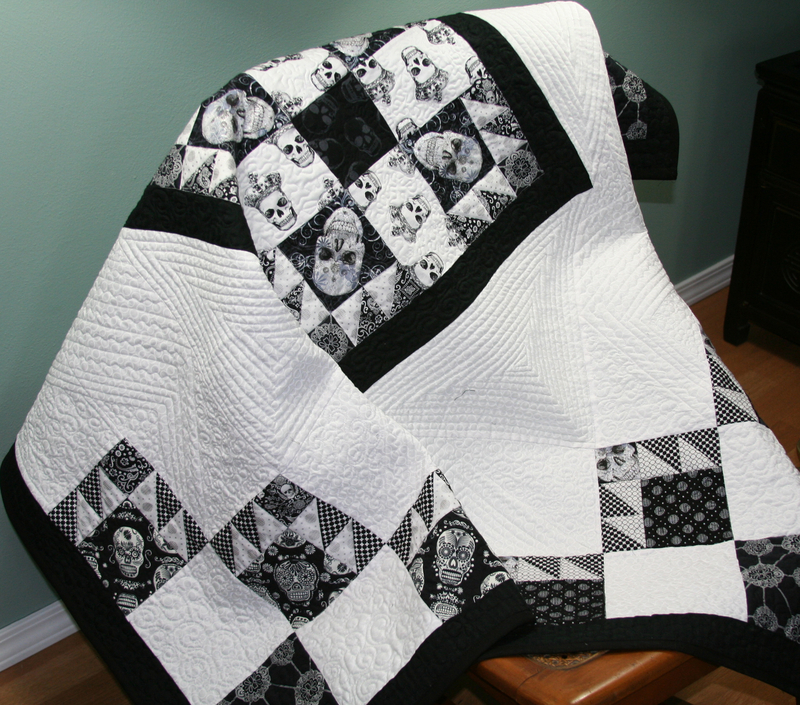 It was the announcement of a BadAss Black and White Skully Challenge sponsored by the BadAss Quilters Society. 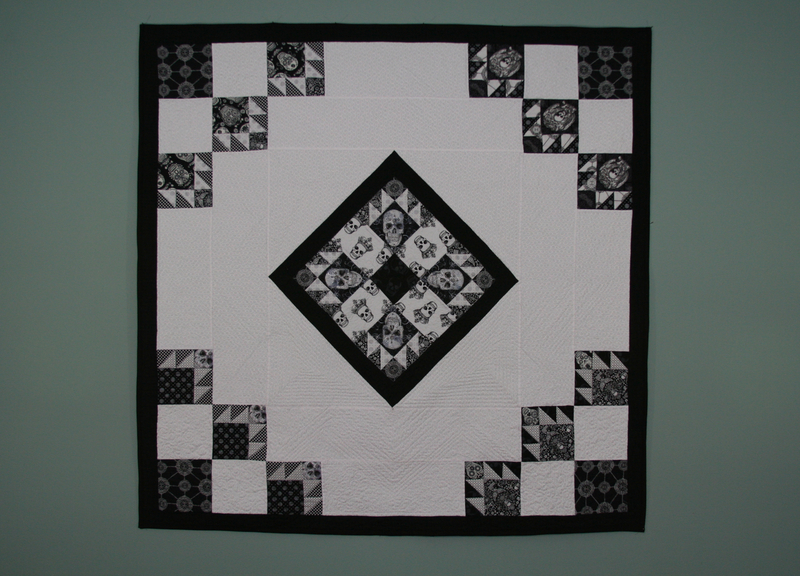 Thinking this might be fun, I promptly placed an order for the black and white skully fat quarters along with another set of black and white fat quarters. Just a few days later my package arrived. Inside I found my fabrics beautifully presented with coordinating ties and a couple of really cool buttons. What fun! Usually, I think and rethink and think some more about what I plan to do when I get new fabric, but this time an idea hit right away. With this nontraditional fabric I decided to do a traditional block, the bear paw. I also knew I wanted a center medallion and quite a bit of negative space. So with a plan more or less in place I began fussy cutting and piecing and the top fell into place. As the top was pieced, I decided to name the quilt Mr. Skully Paws. Mr. Skully Paws was quilted on my domestic machine. I used mainly straight line quilting and added some free motion swirls, pebbles and swirls. Following are pictures of my finished project. 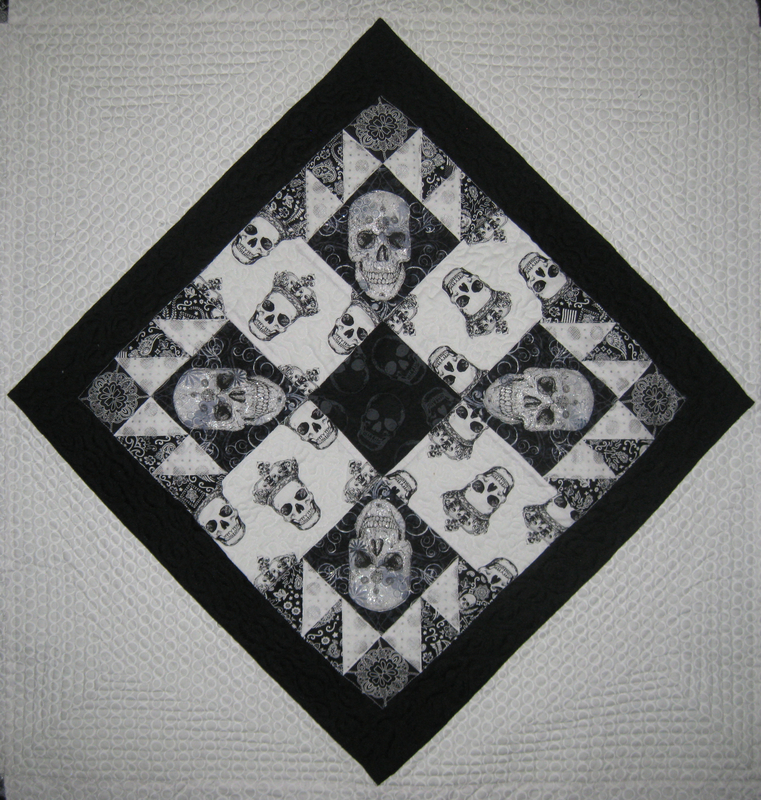 If you go to BadAss Black and White Skully Challenge, you will be able to view my quilt and the others entered in the challenge. Voting begins on June 1 and closes on June 5. I’d really appreciate your vote! Mr. Skully Paws finished at 54″ X 54″. Thank you for viewing the photos of Mr. Skully Paws!